The 2019 Camry is in showrooms. Its updates include Apple CarPlay, Amazon Alexa, and Dynamic Navigation in the four-cylinder XLE and XSE trims (previously only available with the V6). The 2019 Toyota Camry's offers all carry over unchanged in April. When you get to the dealer, expect the LE models to be the easiest to find due to their popularity. 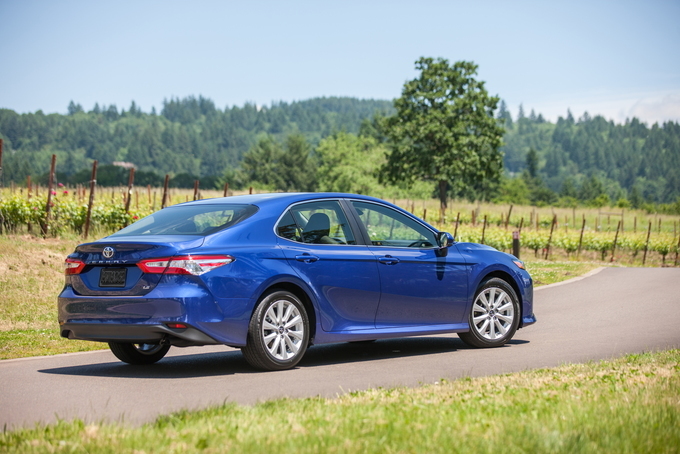 Other versions, like the XSE and Camry Hybrid are harder to find. The 2020 Toyota Camry, which will include a TRD model with sportier looks, upgraded wheels, and a tighter suspension, will start production in August 2019. We expect the 2020 Camry to arrive in showrooms in October 2019. Toyota's deals are regional and expire on April 30, 2019. All deals referenced here are for Southern California unless noted otherwise. Keep an eye out for potential new offers for the Memorial Day holiday. 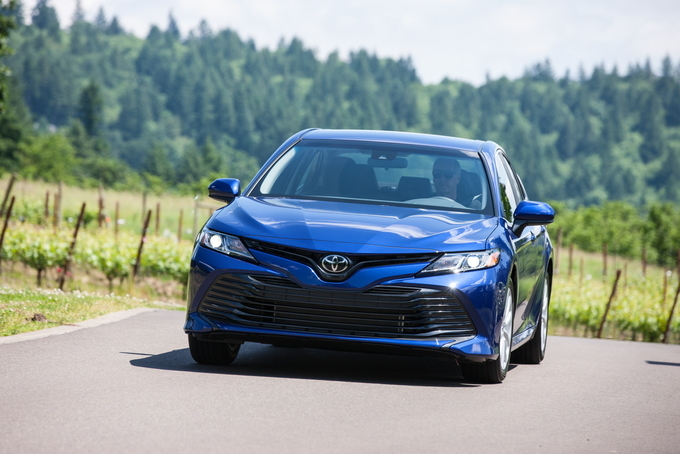 The 2019 Toyota Camry got its first taste of a cash rebate, as the automaker added $1,000 in customer cash in February. This offer carries into April unchanged and is not available with the low APR deal. Qualified buyers can get the 2019 Camry with 1.9 percent APR for 60 months or 2.9 percent APR (1 percentage point improvement) for 72 months. The 2019 Camry has a few promotional lease offers for qualified buyers. These 36-month offers start from $249 per month with $1,999 due at signing for the LE model. Want the sportier SE trim? Just tack on an extra $10 a month. With effective monthly costs of $305 and $315, respectively, these lease offers are good values relative to their MSRPs. The SE is the better value, though. The 2019 Camry Hybrid LE also has a 36-month lease offer that runs $289 per month with $1,999 due at signing. With an effective monthly cost of $345, this is a good value relative to its $28,909 MSRP. Promotional APR Offer Promotional APR programs available for qualified buyers. Please check with your CarsDirect Trusted Dealer for complete details.%NotesManuf% %Eligibility% Contracts must be processed by TFS. EligibilityContracts must be processed by TFS. Having received a dramatic styling and chassis platform designs just last year, the 2019 Toyota Camry continues to face an uncertain market demand due to the escalating crossover craze. For those who are willing to own a sedan, the Camry offers a wide range of trims to suit those expecting a comfortable ride and those who are looking for a more enthusiastic drive. The 2019 Toyota Camry only sees minor feature changes between the trims as its major redesign debuted last year. The 2019 Camry received an all-new platform last year and achieved a lower center of gravity and hunkered-down look. Front-wheel drive is standard and there are a couple of engines from which to choose. A 2.5-liter four-cylinder engine puts out 203 horsepower and 184 pound-foot of torque and comes mated to an eight-speed automatic transmission. This drivetrain configuration earns an EPA-rated 28 miles per gallon city, 39 mpg highway, and 32 combined for the mainstream trims, while the base L trim achieves 29/41/34 mpg (city/highway/combined). Buyers can choose a 3.5-liter V6 engine (also paired to the eight-speed automatic) that makes 301 hp and 267 lb-ft of torque on XLE and XSE models. This engine achieves 22/33/26 mpg, though the highway figure drops to 32 mpg on XSE trims. The base L trim starts at $24,765 (all prices include the $920 destination charge) and features Toyota’s Entune infotainment system that's controlled through a seven-inch touchscreen and is compatible with Apple CarPlay and Amazon Alexa. Also featured are lane keeping assist, automatic emergency braking, adaptive cruise control, and LED headlights with automatic high-beams. There are no packages available on the Camry L.
The LE trim brings the car into the mainstream consumer world for a price of $25,270. The feature list includes larger 17-inch aluminum alloy wheels that replace the L’s steel wheels, an eight-way power driver seat, and a split-folding rear seat. The Blind Spot Monitor with Options package ($1,200) brings blind-spot monitoring, rear cross-traffic alert, proximity entry, Homelink, and an auto-dimming rearview mirror. The Power tilt/slide moonroof with options package ($2,100) adds all of those features plus a moonroof, while the Audio Package with options ($3,365) builds off of that and also adds an upgraded Entune audio system, dual-zone climate control, and wireless smartphone charging. The SE trim presents a sportier attitude with standard sport suspension and larger 18-inch wheels. Starting at $26,470, the SE also gains automatic climate control, synthetic leather-trimmed seats, a leather-wrapped steering wheel with paddle shifters, a unique black front grille with mesh inserts, and more aggressive side rocker panels. The same packages from the LE are again available, though the moonroof is available on its own for $900. The XLE is $29,845, or $34,970 with the V6 engine, and reverts back to the standard suspension and bright exterior trim pieces. The content level builds on what was offered with the SE and adds a seven-inch driver display in the gauge cluster, LED taillights, additional USB power ports, and heated leather seats with eight-way power adjustment for the driver and passenger. The option packages also build on each otherand begin with a panoramic glass roof for $1,045. The Navigation Package ($1,760) brings navigation and the upgraded Entune audio system. The Navigation Package and panoramic glass roof can be bundled together for $2,805. Finally, if buyers are looking to maximize the features on the Camry, the Driver Assist Package ($4,980) includes the panoramic glass roof, upgraded audio system, navigation, and a 10-inch head-up display, automatic emergency braking, adaptive cruise control, and a surround-view camera system. On V6 models, the Driver Assist Package with options is the only option group available for $2,590, as the panoramic roof, navigation, and upgraded audio system are standard. The XSE carries similar features as the XLE and brings a darker shade of styling. Priced at $30,395, or $35,915 with the V6, the sport suspension and dual exhaust features are supplemented by dark styling with darkened headlights, a black painted roof and spoiler, and unique 19-inch wheels. The optional features mirror those of the XLE trim. 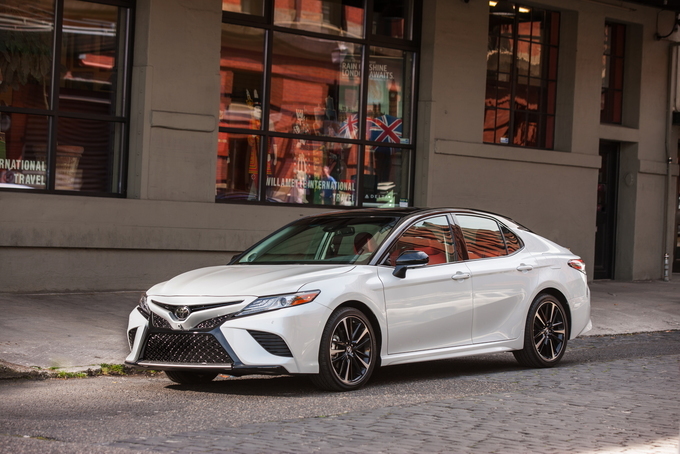 Of the 2019 Toyota Camry lineup, the LE trim brings a healthy list of connected tech and the available option packages allow buyers to upgrade their sedan as they see fit. Consumers continue to shift their purchase decisions away from cars to crossovers and SUVs. 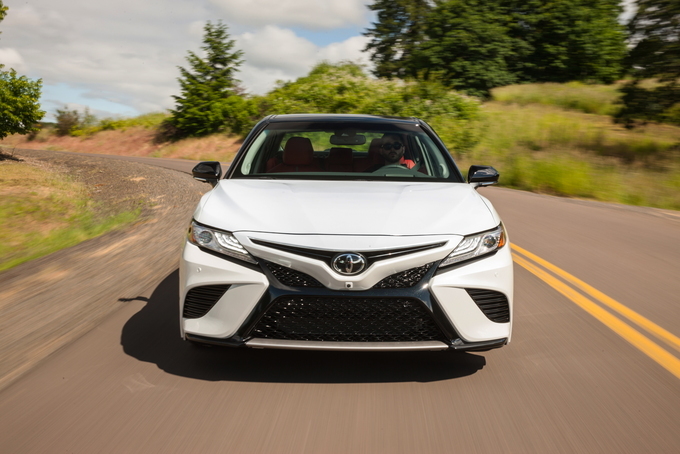 The 2019 Toyota Camry is a mid-size, front-wheel-drive sedan that makes a compelling reason to consider a car. One year removed from a major overhaul that gave this sedan sportier looks and more standard features, the 2019 Toyota Camry remains a crowd favorite in a shrinking segment. The 2019 Toyota Camry occupies a competitive segment that has seen a steady decline in recent years as consumers opt for higher-profile vehicles. That said, Toyota gave the Camry a major overhaul in 2018, a move that made it one of the freshest sedans in the segment. For 2019, the Camry returns with light changes. Toyota offers the standard Camry in five trims: L, LE, SE, XLE, and XSE. Most models come with a 2.5-liter four-cylinder engine. The two top trims have an optional 3.5-liter V6. An eight-speed automatic transmission is standard across the lineup. The base trim has such features as LED daytime running lights, steel wheels, keyless entry, a backup camera with guidelines, an Entune audio system, and Bluetooth wireless technology. All models come with Toyota Safety Sense P. This suite includes automatic high beams, forward collision warning with safety detection, lane departure warning with steering assist, and adaptive cruise control. Our recommended Camry XLE model builds on the three trims below it, adding numerous features. These include full LED headlights, heated side mirrors with embedded turn signals, alloy wheels, dual-zone climate control, leather-trimmed seats, wireless smartphone charging, three USB ports, and an electronic parking brake. 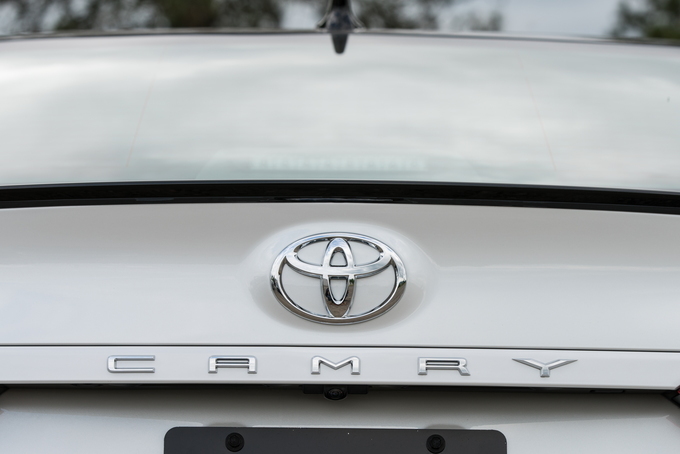 The Toyota Camry offers two very different power choices. We went with the thrifty and economical 2.5-liter four-cylinder engine, mostly for its price and efficiency. This engine does what most Camry owners expect: take them from point to point in the most efficient way possible. Toyota marries this engine to an eight-speed automatic transmission. This combination enables the 2019 Camry to achieve a laudable EPA-estimated 29 miles per gallon city, 41 mpg highway, and 34 combined, though these figures drop slightly as you move up the trim range. 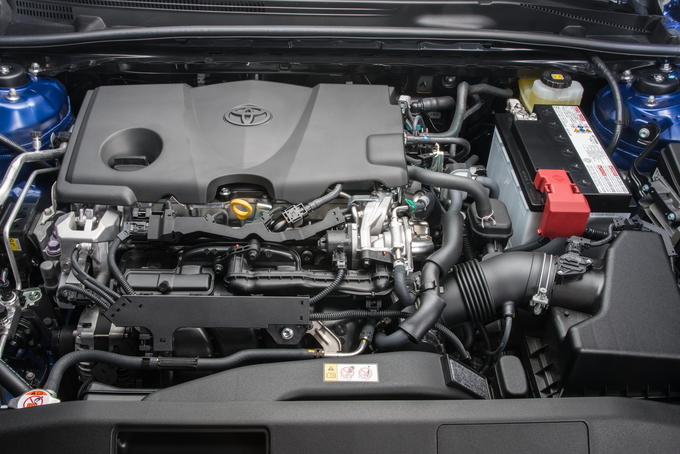 The Camry’s base engine delivers sufficient power, although at low speeds the output isn’t as strong as we’d like. The XLE supplies a soft ride and light, but accurate steering. You’ll notice some lean as you turn corners, and if you’re looking for enthusiastic driving, then the V6 is the better choice. Bland is no longer associated with the Toyota Camry. The current-generation model is sleek, sporty, and handsome. The styling is evocative, even provocative, especially at certain angles where the lines intersect haphazardly. Regardless, the overall look is a clean and an effective departure from earlier versions. 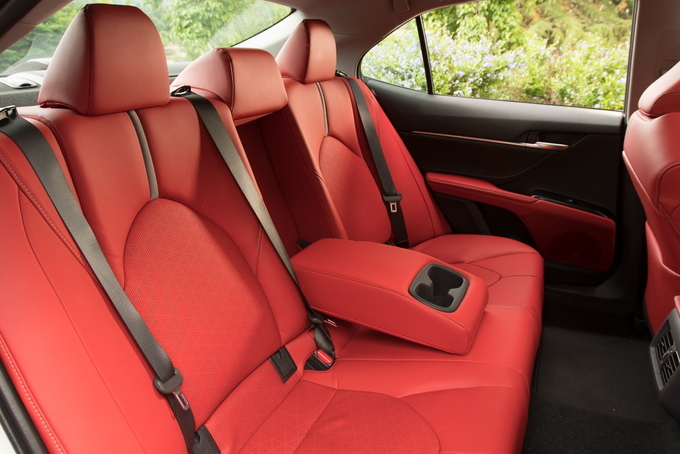 Toyota went all out with the Camry’s interior, delivering a class-above look, which is especially apparent on its top trims with leather seating. The XLE goes with the eight-inch color display, which delivers a crisp look and is positioned up high on the center stack. The center stack itself is a focal point, highlighted by intersecting lines that cleanly separate the passenger compartment. The cabin is roomy, the rear seat surprisingly so. 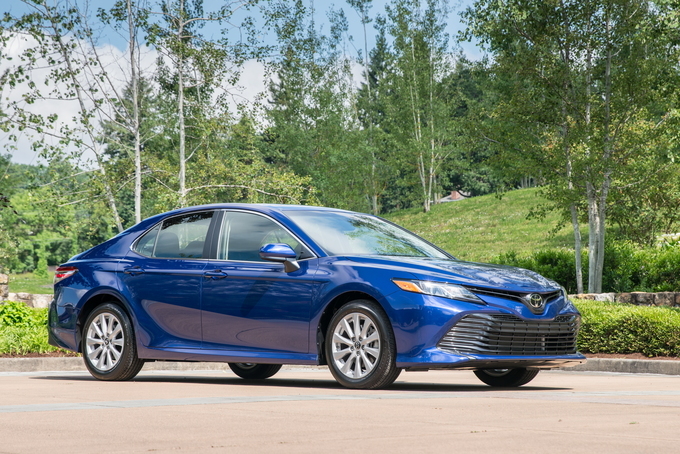 Toyota’s reliability, particularly with the Camry, is noteworthy. Buyers may not expect a fancy car, but they can rely on one that'll serve them well for many years. Toyota has gotten smartphone compatibility partly right with the 2019 Camry. Apple CarPlay is now standard, but if you have an Android phone, you still won’t find Android Auto. If a sedan appeals to you, you won’t go wrong with the Camry. In most areas, it meets or exceeds expectations and does so at an attractive price point. The consumer who wouldn’t be interested in a sedan wouldn't want the Camry, but that’s where the Toyota RAV4 and Highlander close that gap. The 2019 Toyota Camry does everything it has to do to appeal to mid-size sedan buyers. Where manufacturers such as Ford and Chrysler are abandoning the segment, Toyota doubles down by delivering a model that's second to none.